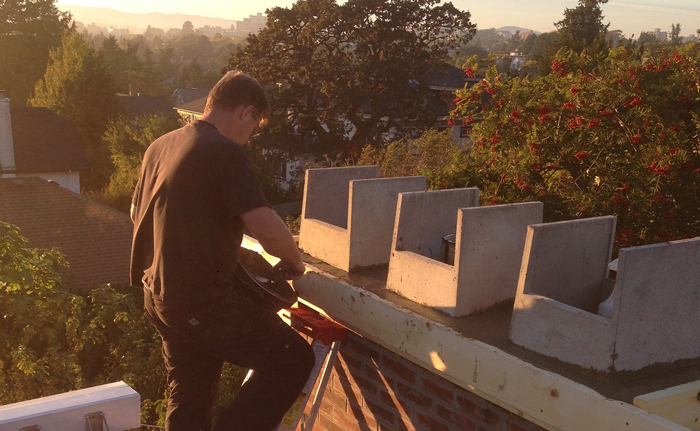 Aero offers a variety of repairs such as re-pointing (tuckpointing), crown repair, and installation of chimney caps. All estimates are detailed in writing, and backed by our customer satisfaction guarantee. There is a ten year warranty on all work. Upon request, we will promptly inspect the chimney and provide a free estimate before we leave. Re-pointing of the mortar, replacing any damaged bricks. Set-up the forms and pour the concrete crown. If rain caps are needed they are embedded in the crown. The whole chimney is then acid washed to remove any extra mortar on the bricks. (This also cleans the bricks bringing out their color.) Then a waterproofing sealer is applied to protect the chimney. 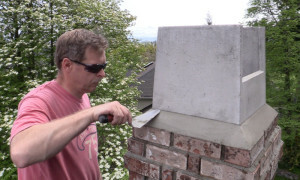 Our chimney caps are comprised of concrete and are cemented in place. They also have a ten year warranty. They protect the flue from weather especially rain. Rain can enter a flue and run down causing damage to the flue liners and brick. Rain will rust out metal parts of your fireplace including the damper and firebox. If you see water drip marks inside your fireplace or running out of your flues clean-out you should have a chimney cap installed! We install roof top dampers for fireplaces who have no firebox damper or if theirs is beyond repair. 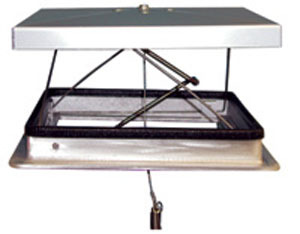 The roof top damper is affixed to the top of the flue and a cable is run down into the firebox. When you have a fire you pull the cable handle opening up the damper. You close it after the fire has gone out to prevent household heat from escaping out the flue. You’ll save on your heating costs by stopping drafty fireplaces from sucking out all your heat. 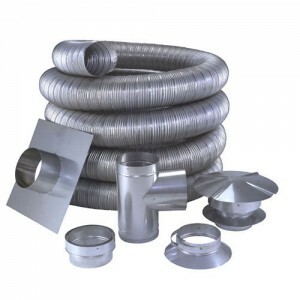 At Aero we install chimney liners of all sizes and types. We can replace a burnt out liner who has passed it’s life expectancy or we can install one into a masonry chimney making it safer and more efficient. Masonry chimneys have either flue tiles made of clay or concrete or no liner just brick and mortar. We often find if the woodstove or oil furnace is in an older house (pre 1950’s) there is oftentimes no liner. If that’s the case we do recommend a stainless steel liner to bring it up to code and make it safer. When a masonry chimney has broken clay or concrete flue tiles or after a chimney fire it may be time to install a liner system. We can give you a competitive install quote backed up with our warranty. Creosote is a liquid that condenses onto the inner walls of connector pipes and chimneys as wood smoke cools. When creosote dries, it gradually hardens, taking the following forms: Stage 1 (velvet soot), Stage 2 (porous and crunchy in makeup) or Stage 3, shiny, rock-hard chimney glaze. The buildup of chimney glaze is denser and harder than brick, and sticks to the chimney inside walls. Aero Chimney Sweeps have the tools and knowledge to de-glaze your chimney right! To mechanically clean your system, Aero’s technicians use a mechanical high-speed, half-inch drill and a chain whip. These tools will allow us to break down and safely remove the glazed creosote without damaging the chimney. Best service I have received in 50 years. I’m a regular customer of Andrew’s and I had a problem with my fireplace damper. He came out on Thanksgiving day to fix the problem so we can have our family Thanksgiving with a fire! Dave was very professional and knowledgeable!! He explained in detail, how to properly clean, maintain, and get the best efficiency from our wood stove. We will definitely request Dave, as our technician next year.